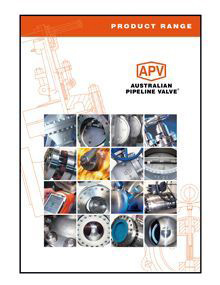 Australian Pipeline Valve (APV) was established in 1989 as a specialist manufacturer of quality valves and pipeline products for oil & gas as well as petrochemical, power generation, mining, process and general industrial applications. The cornerstone of APV is quality and service. We focus on clients who require a high quality, technologically advanced product as well as comprehensive documentation and certification. 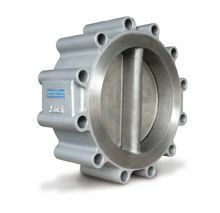 APV manufactures a broad range of American Society of Mechanical Engineers (ASME) and American Petroleum Institute (API) compliant valves including gate, globe and check valves. We also offer a large range of quarter turn valves including floating and trunnion ball valves in soft and metal seats, lubricated and lined plug valves as well as butterfly valves in lined and high performance types. To complete the range, APV also manufactures a selection of complementary products such as actuators, gearboxes, strainers and sight glasses. As a long term oil and gas specialist, we have also been supplying APV oilfield wellheads, valves and chokes since 1989.
quality, safety, ease of operation, simple in-line maintenance and most of all, long service life. All this combined with the use of high quality materials and advanced manufacturing technology ensures the highest possible quality at a competitive price. APV is strongly committed to increasing our market position and competing in all countries around the world. The company’s impressive growth over the past 20 years is testimony to its strong competence in research, design, production and marketing with a firm determination to maintain its position as a short lead time, high quality manufacturer in the valve industry, today and in the future. APV is controlled by valve experts and our accredited subcontractors are technologically advanced. We are an independent privately-owned entity able to respond much quicker than major manufacturers while ensuring a much higher level of attention to detail. APV is a valve specialist, controlled by knowledgeable and skilled valve experts. APV manufactures valves for chemical, petrochemical, utilities and oil & gas industries, for both domestic and foreign markets. Our headquarters is located in Adelaide, South Australia. the cornerstones of our business philosophy. 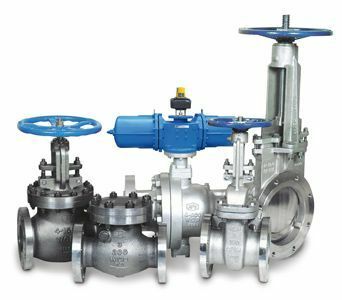 Metal to metal seated ball, butterfly and plug valves, abrasive and high temperature service valves. 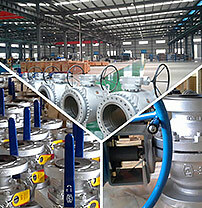 Also cryogenic valves, buried service valves, LNG valves and ESDV packages. and standards may be considered upon request. 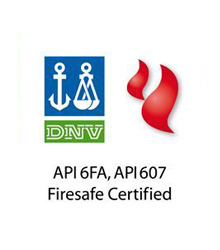 APV believes in the importance of the final testing of the product. 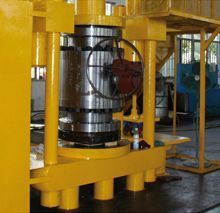 Dimensional and functional control test are carried out on every valve; pressure testing is performed in accordance with API 6D - API 598 - ISO 5208 - API 6A - ASME B16.34 - EN 12266-1 - BS 6755 or MSS. All our valves are shipped with comprehensive mechanical, chemical and pressure test material certification (MTC) according to DIN 50049.3.1 or 3.2 (EN 10204.3.1/3.2) as well as other certification, depending on client request. 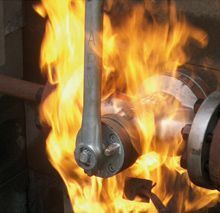 Special tests such as cryogenic, fugitive emission, HP gas test, etc., can be performed. 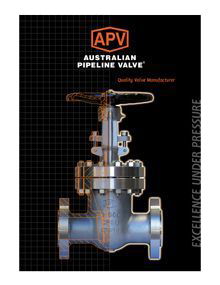 APV offers one of the most comprehensive ranges of valves. From the most common application to the most severe, APV has a solution. 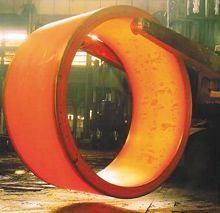 We produce gate, globe, check, ball, plug and butterfly valves in conventional and engineered severe service configurations in sizes up to 1500mm (60”) and for services up to ASME Class 4500. 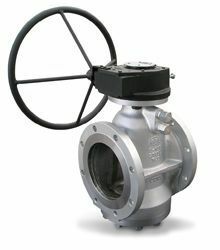 Our valves are available with a near endless selection of body materials, trims, options and accessories. 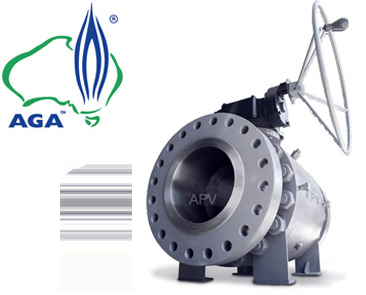 From options such as bypasses and counter weights to special trims for abrasive, geothermal HF acid or NACE service, APV can provide valves built to your needs - often directly from our extensive stock holdings. 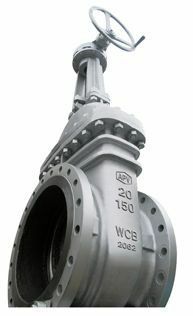 Valves can be manufactured with special face to face dimensions, end connections and bore sizes. All APV valves are available with actuation packages according to customer needs. This includes electric, hydraulic and pneumatic actuation with a complete range of controls and accessories. 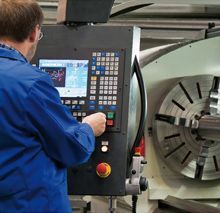 Our in-house automation facility also ensures actuation and control options can be produced in very short lead times. Take into account all the factors involved in owning a valve, including installation, service and maintenance. 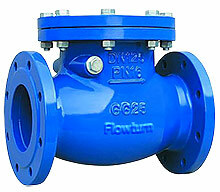 The total cost of ownership of a valve can be several times the initial purchase price. APV valves are designed and manufactured with this in mind. Our valves will save you money, by lowering maintenance costs, increasing service life and increasing the chance that a valve can be repaired rather than replaced. 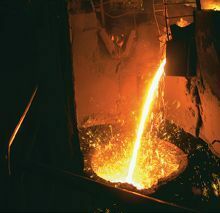 The performance of our valves has been proven over and over again in thousands of installations. Customers throughout the world have made APV their preferred choice, based on our track record. Apart from the industry-leading performance of our valves, APV offers supplier-integrated engineering, value-added services and all the other advantages you would expect from dealing with a forward thinking valve specialist. 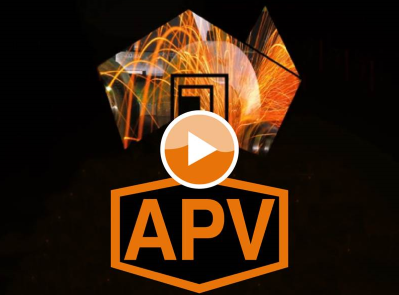 APV manufactures a complete range of ANSI/ASME, API, MSS, ISO, BS and AS valves such as check, gate, globe, as well as firesafe certified ball, butterfly and plug valves for petrochemical, oil, gas, mining, process and industrial markets under the APV brand. APV also supply oilfield wellheads and associated products. The APV family also includes a fleet of established, trusted brands which cover a broad range of valve types and pipeline products for all industries. These brands have been sold around the world for over 20 years through our established distribution network.